Enriching lives of children of all ethnic and religious backgrounds, ages 9-18, suffering from serious illnesses by creating free, memorable and medically safe camping experiences. Jordan River Village provides a free, safe, fun, and supportive camp experience for all Israeli children who live with serious and chronic illnesses. Regardless of background, religion, ethnicity, or physical limitations, children who come to the Village leave their illnesses at the door and engage in a wide variety of programs and activities. Campers meet other children who face challenges similar to their own, make life-long friends, and create important support networks. At the Village, children truly celebrate life! In 1988, acclaimed actor and philanthropist, Paul Newman, opened The Hole in the Wall Gang Camp for children with serious illnesses in Ashford, CT. This remarkable concept sparked a quiet global movement as one camp evolved into 30 camps and programs worldwide and counting. In 2012, The Association of Hole in the Wall Camps changed its name to the SeriousFun Children's Network, a global community reaching children from 50 countries, across five continents. The Jordan River Village began as a dream of our founders, Murray and Marilyn Grant (z"l), and the Village opened for operation in August 2011. The Village’s 60-acre, wheelchair-accessible campus in the Lower Galilee of Israel is the only camp of its kind in the Middle East. Open year-round, the Village can accommodate up to 64 campers during each session. The Village has everything expected at a children’s camp: 12 bright and comfortable camper cabins, a communal dining hall, theater, sports center, arts & crafts building, a specially heated and treated pool, library, petting zoo, adventure tower, and more. The Village also has a state-of-the-art, yet unobtrusive 24-hour medical center. • To provide free, fun-filled, medically safe camp experiences children of all religious and ethnic backgrounds in Israel suffering from life-threatening and chronic illnesses. • To offer respite from the physical, and the psychological trauma these children suffer from dealing with their chronic illnesses and medical conditions. • To ensure that each child enjoys the best time of his or her life, and leaves the Village with a better sense of self-worth. • To offer respite and relaxation to parents and siblings of these children, who suffer from related stress-based challenges. • To allow kids to simply have fun, leaving their pains and worries at the door. The Jordan River Village operates year-round, and serves children of all religious and ethnic backgrounds, including Jewish, Muslim and Christian children (9-18), suffering from serious illnesses and life threatening conditions at no cost to their families. The Jordan River Village encompasses 60 acres in the Lower Galilee, It has a comfortable climate for almost the entire year, and is located within close proximity to hospitals that may be needed in case of an emergency. Campers who visit the Village have the experience of a lifetime. They leave their illnesses at the door, and participate in the broad range of camp activities enabling them to have fun, succeed, come together, and discover new things. In addition, campers meet others who face challenges similar to their own, and make life-long friends, and circles of support. Children can hold collection drives for items needed at the Jordan River Village, such as: used cameras, video cameras, games, costumes, musical instruments. They can write an article for their local newspaper about the Village or post information on social media websites. Children from across the Middle east, regardless of race or ethnicity, who suffer from serious and chronic illnesses. Up to 64 campers per session, up to 40 sessions per year. 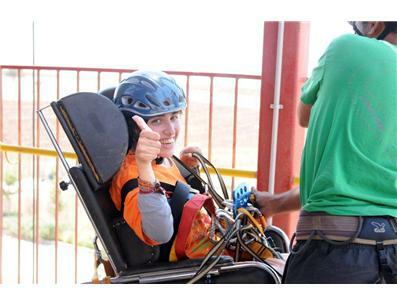 Our adventure park, first of its kind in Israel, that enables handicapped children to fully participate, includes zip line, climbing wall, ropes and log activities.